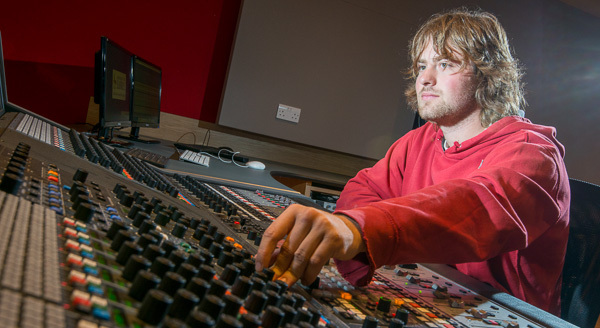 As part of the Tonmeister programme, students are expected to record a wide range of music in a wide range of styles. Hence they are always looking for bands and ensembles to record in our studios or on location. The Institute of Sound Recording has the facilities to record all styles of music to a professional standard, however the student engineers are still learning their craft and so whilst recordings are usually of a high quality we cannot guarantee a professional result. If you are looking to make a commercial recording, we would recommend that you book a commercial studio/engineer (apart from anything else, you’ll be keeping our graduates in work). Email your recording requirements (style of music, size of group, availability, location or studio, etc) and contact details to Russell Mason (r.mason@surrey.ac.uk). We will post what you send on our Recording Noticeboard and any students who are interested will contact you directly. You will be able to make use of the recording for free distribution or a small number of sales. If you wish to exploit the recording commercially beyond this, the University may ask for a fee for sound recording copyright clearance; this fee will depend on the intended duplication and distribution and must be negotiated with the Programme Director of the Tonmeister programme via the student who made the recording. NB. Our studios and equipment cannot normally be booked by our student engineers during the months of June/July/August. The exception is if a student (or graduate) is hired to run a commercial session during this period. Our studios may occasionally be booked commercially, but these are usually limited to the Summer Vacation. To enquire about commercial bookings, at commercial rates, please contact our Studio Manager Oliver Doyle (o.doyle@surrey.ac.uk).